That’s right. You thought all along that Bird, Lime and Uber were the first scooters to show up along the streets of downtown Atlanta. Not so. Electric (and gas) scooters were used by the Atlanta Police Department since at least 1916, although it is apparent that they have not used them in quite a while. So let’s get this straight, the Atlanta police department was using electric scooters in downtown Atlanta over a 100 year before Bird and Lime scooters showed up. An amazing fact, to say the least. In 1916, these electric scooters were not considered a nuisance and they did not wind up being left on the side of roads and sidewalk, like we see today. The reason: probably because the initial Atlanta scooter were police department property and had to be signed in an out of the police motor pool. In other words, accountability played a role in making sure that the scooters were safely placed in storage when not in use. 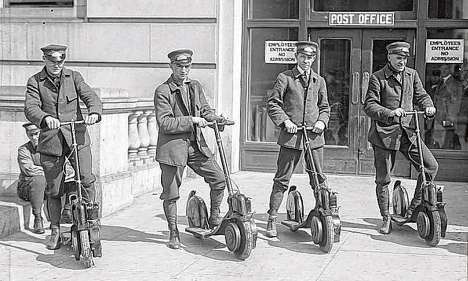 Of course, there was no also a rash of electric scooter related accidents in Atlanta when these scooters went into service in 1916. Probably because the officers received training on the use of the scooters and the scooter were maintained properly by the police department. According to the AJC, a 1916 front-page report describes the “sensational” first sightings of a new fad: the Autoped, which the reporter describes as a “man-toting, animated lawn mower.” Autoped motor scooters were made from 1915-19 by the Autoped Co. based in Long Island City, N.Y. (a German company made them for two years after that). The gas-powered version was more popular, but the company also made a version powered by a battery. In its heyday, postal carriers and traffic cops used the vehicles in some cities. The first-ever CDC scooter study will look at how scooter accidents can be prevented. The scooter study was launched in December when three CDC epidemiologists spent two weeks in Austin, TX reviewing incidents and scooter-related injuries during a 60-day period from September to November. They began contacting the 258 individuals identified through EMS calls or who visited emergency rooms with a scooter-related injury. Findings from this study will likely be released in March and could have far-reaching effects as cities such as Atlanta across the country grapple with reports of injuries from these e-scooters. “We don’t know if there’s something unique about Austin or the population there that may be different from other parts of the United States or globally,” said the chief of the Atlanta-based CDC Epidemic Intelligence Service, which is conducting the probe. “The rate of scooter injuries in Austin may be consistent with what’s being noticed in other places, or it may be much higher.” In Atlanta, the number of injuries per month has increased from about 30 to about 100, said the chief of emergency medicine at Grady Health System, which includes Grady Memorial Hospital, the largest hospital in Georgia. Grady, which is among the nation’s busiest Level 1 trauma centers, is looking at the rise and scope of scooter injuries as a new internal project. “I’m concerned people are riding these things without helmets and on roads in busier traffic,” he said “As opposed to motorcycles, these wheels are pretty small. Certainly, hitting a pothole can send someone over.” This is a big distinction for a number of reasons, not only are the scooter wheels much smaller, the riders are not familiar with the scooters (as they would be with their own bicycle, scooter or motorcycle) which tends to lead to unsafe conditions. Couple this with questionable inspection and maintenance programs for some of the scooter companies and the rise in accidents is certain to continue. We have seen a spike in the number of serious injuries on e-scooter such as Lime and Bird, especially on and around college campuses such as Emory, Georgia State University and Oglethorpe. Many students rely on these scooters as stop-gap transportation but fully appreciate the dangers associated with them. The state of Georgia had 112 motorcycle accident deaths during the first nine months of 2009. That figure had dropped to 98 fatalities during the first nine months of 2010. A small drop like this may not mean much, especially since the sharpest declines were noted during the first few months of the year, when Atlanta motorcycle accident lawyers noted fewer motorcycles on the streets. The Governors’ Highway Safety Association has released projected estimates for motorcycle accident fatalities last year, and predicts that there will be 4,376 motorcycle accident fatalities in 2010. That is a 2.4% decline from last year, and the agency is warning that motorcycle crash fatalities over the next couple of years could actually increase unless both the federal and state administrations begin taking stronger steps to prevent such accidents. In Georgia, many motorcycle accidents occur on I-75/I-85 going through downtown Atlanta due to the high rates of speed coupled with the numerous lane shifts and merges that occur when Interstate I-75 and Interstate I-85 merge as they go through the Atlanta city limits. While these road conditions may not be the proximate cause of the numerous motorcycle wrecks which occur on our interstate, the road conditions certainly do play a part. The plaintiff suffered damages in the form of personal injuries due to the negligence of the at-fault driver. While a lawsuit is certainly available to help the injured victims of motorcycle accident recover for their injuries, there is more that could be done to save lives in motorcycle accidents every year. For instance, enforcing stronger helmet laws for motorcyclists would help. The Governors’ Highway Safety Association report is also drawing attention to an unwelcome trend-helmet use of the country is actually down by 15%. In Georgia, we could also invest in awareness among motorists about avoiding collisions with motorcycles. There’s no doubt that motorcyclists face myriad of challenges as they ride on Atlanta’s congested streets. Just last week, yet another motorcyclist was killed in a hit-and-run accident in Atlanta. According to the Atlanta Journal-Constitution, the motorcyclist had run out of gas, and had stopped his motorcycle in the merge area between the westbound lanes of I-20 and I-285 on-ramp. He was struck by a motorist, who then drove off from the scene of the accident. Unfortunately for the motorist, an off-duty trooper was just behind the motorcycle, and gave chase and the at-fault driver has been arrested and faces a host of charges. The motorcyclist did not survive the crash. On my main web site, you can find the Motorcycle Accidents page which explains the legal aspects of a motorcycle accident. However, I recently came across a report on motorcycle accidents that I would like to share. It is called the Hurt Report and a full copy is available for ordering. Since it is a 1981 report, many people would discount it as not being up-to-date or relevant. However, to me, it appears just as accurate and pertinent today as it was almost 30 years ago. Since we cover the law on our web site, this is simply an instructional piece which illustrates HOW motorcycle accidents happen. Once we know HOW they happen, we can glean WHY they happen. Then, once we know HOW and WHY they happen, our readers can hopefully use this information to become safer bikers and drivers. -The use of a helmet is the single most critical factor in reducing serious head injuries to motorcycle riders. Considering that there were over 1,500 motorcycle riders killed in Georgia accidents last year, the above information should prove informative and helpful. It is our sincere hope that all Georgia motorcycle riders can ride safely. While every accident has its own set of facts and nuances, it is important that the injured party retain counsel as soon as possible. Once retained, a thorough investigation will be conducted to determine the road conditions, factors that caused or contributed to the wreck, potential responsible parties, potential layers of insurance that may apply to the claim, eye witnesses, contact information for police who arrived at the scene, EMT personnel involved, witnesses, medical professionals who may have rendered care and treatment to the injured, towing companies involved, etc. Pictures of the property damage to the vehicles should also be timely taken to document the severity of the damage. According to an Atlanta police spokesman, an unidentified motorcyclist “struck a bridge abutment and was killed instantly” this morning. This appears to be yet another catastrophic single vehicle Atlanta accident. At first blush, that might end the inquiry as to who was at fault in this tragic case. “Before a municipality may be held liable for maintenance of a nuisance, (1) the alleged defect or degree of misfeasance must exceed mere negligence; (2) the act must be of some duration and the maintenance of the act or defect must be continuous or regularly repetitious; and (3) the municipality must have failed to act within a reasonable time after knowledge of the defect or dangerous condition. [Cits. ]” Shuman v. Mayor &c. of Savannah, 180 Ga. App. 427, 428 (349 SE2d 239) (1986).